Feeling lazy to study? Sometimes we are so lazy to studying or even finished tasks and homework. But it is naturally often experienced by students. Like the forehead wrinkled in school hours was not enough, it becoming heavier with another tasks waiting for us at home. Infrequently we just finish a task or homework given in the last hours just before going to school or even late night when you're done reading comics and a few hours of sleep. However, when the exam season begin of course we don't want the usual laziness come to use for exam preparation. Laziness should be our main enemies. We should begin to establish good time management so the patterns of learning, our social life and relax will be balanced. Of course it would be better if we could set that time has become a habit and can be applied in everyday life. Step one: What is our priorities? The initial step is for improving our time management to make a list of anything we have to do. 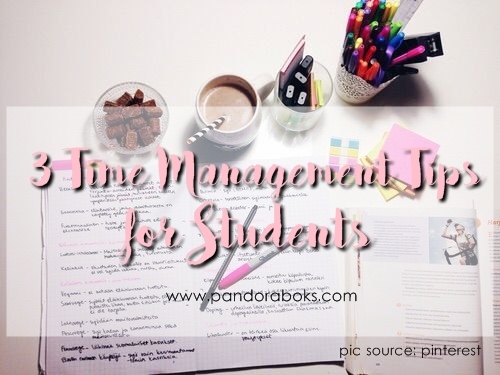 It might sound like a person who is obsessed with make anything being listed and everything but based on experience, most students have the potential to forget important tasks until the last moment. So they had to finish it quickly in a state of panic. This of course will affect the quality of the job they are doing. Usually as students we spend a lot of time to learn, socialize and play and whatever we think we should do. But as students, we are also expects to spend some time each week to repeat the lesson that we got and learn to prepare for the exam. Determine how long our target in total, including learning in the classroom, tutoring at a tutoring agency and learn at home, for example. The target was applicable not only in certain times, but must be routine. If it turns out in a day that we are targeting studied for 10 hours, including the time at school, tutoring and at home but on that day is a holiday for tutoring for any reason then add the same hours to learn at home so we are daily learning targets achieved from day to day. There's so many learning distraction that may arise when we are in a learning session, for example when we are study in the classroom and in the middle of studying we were imagine that we are not in a classroom but in our bedroom were playing the latest games that we have not been finished until the end of game. This could distracting us so we could not absorb maximum lessons so it would be difficult if we want to re studying for exam preparation. If we are a person that easy to being distracted or interference when studying so it will be easier for us when we study by ourselves then join the study group. We were most likely even tipped chatting or doing other activities with our friends in the same study group. But if we are not person who easily distracted, the study group will be very pleasant due to exchange and share knowledge together. Distractions, exactly. When I was in college, I'd be extremely annoyed when someone or something interrupted my projects. Even up to now multitasking is hard for me. Therefore I'd be very grateful if people just let me focus on my job. Ini sangat membantu sekali mbak untuk para mahasiswa okeh terima kasih nih mbak tipsnya. Stay away from friends who give bad impact in order to stay straight to our goal.